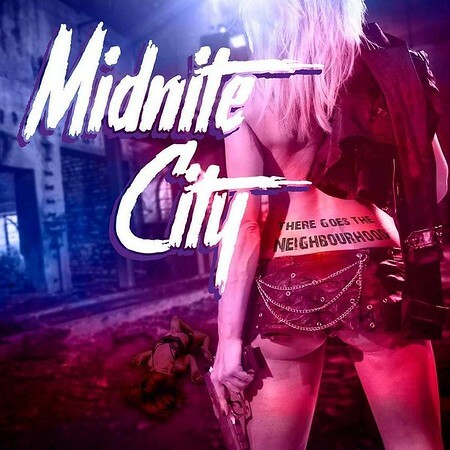 Midnite City was formed in early 2017 by Tigertailz singer Rob Wylde after he disbanded another long term project called Teenage Casket Company. Wylde had joined Tigertailz in 2012 as the guitarist before taking up the bass position and finally the lead vocalist role in 2015. Wylde worked with producer / musician Pet Newdeck on the first album and he returns to produce “There Goes The Neighbourhood”. Pete Newdeck also plays drums in Midnite City and he and Rob are joined by Miles Meakin on guitar, Shawn Charvette on keyboards and Josh ‘Tabbie’ Williams on bass.